Maple Lawn is a mixed-use community built on the principles of Traditional Neighborhood Development – a town planning philosophy inspired by the small towns of the late 19th and early 20th centuries. These small towns were distinctive, prosperous, thriving and more importantly, had a sense of community. Maple Lawn, Maryland is that kind of place. Recognized for its award-winning architecture, the ease of walking into shops, services, and even work, its large areas of open space which are infused into the community, the unique mix of boutique shops and high quality restaurants, and the small town feel…it’s a place unlike anywhere else. Pedestrian-scaled neighborhoods with small blocks, varied housing styles, and interconnected tree-lined streets encourage walking and interaction among people within five different neighborhoods with a total of 1,340 homes planned. Corporate offices and medical/professional buildings provide jobs and services for Maple Lawn residents and for others nearby. Generous open spaces and recreational amenities, such as the Maple Lawn Community Center, offering opportunities to relax and rejuvenate, are a cut above those offered by most planned communities. The result is a more enjoyable, practical way of living, where families can live, work, shop, dine and spend quality time together. 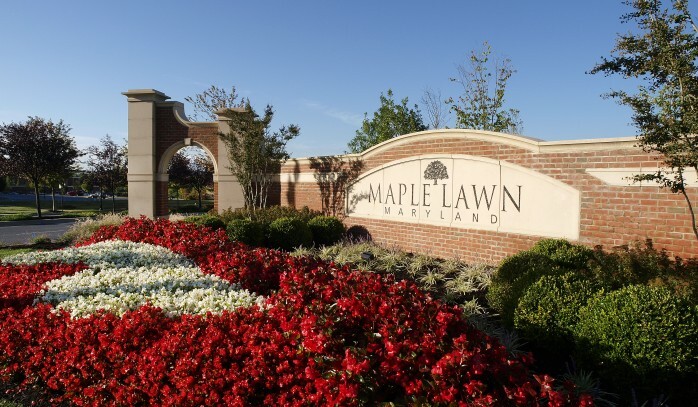 Developed by Greenebaum Enterprises, and in partnership with St. John Properties, Maple Lawn has been recognized as a premiere community and honored with many distinct awards. For more information regarding this community’s achievements, please visit Greenebaum Enterprises and St. John Properties. To learn more about Maple Lawn, click here to download our brochure.